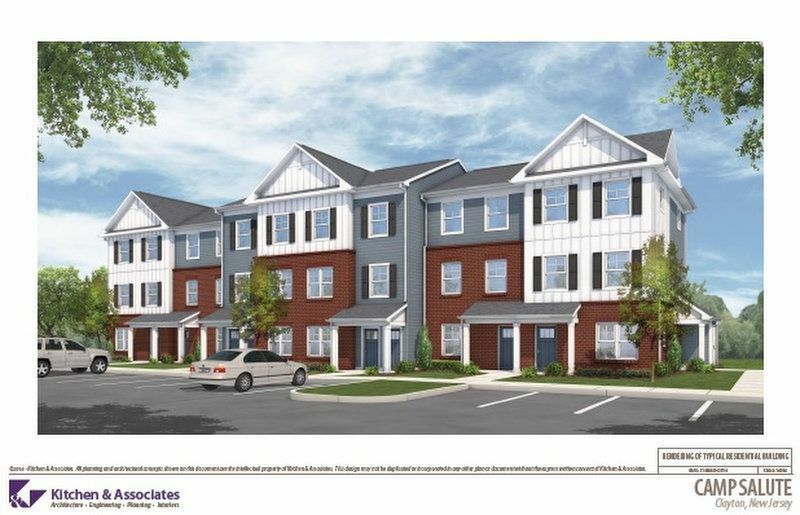 The buildings will feature 19 apartments set aside for veterans with disabilities, a community room, and the South Jersey Veteran Resources Center. There, staffers from the People for People Foundation, of which Blackstock is the CEO, will help veterans – including those who live outside Camp Salute – access services like their educational benefits. “It didn’t hit me until this morning, ‘Oh my God, today’s the day,'” Blackstock said, gesturing to a 57-acre dirt lot behind the Mews, covered in CAT construction vehicles and trailers for construction employees to lead the work at the job site. The day has been a long time coming. The idea for the project came about in 2010 when Allan Connors, a Vietnam vet who spoke at the ceremony, proposed the idea of a space to house veterans in need. The next five years were spent selecting a site, Sam Leone, president of Conifer Realty, said at the event. Then, financing had to be secured for the project, for which development is expected to cost nearly $23 million. Funding for the project is helped by Low Income Housing Tax Credits which total about $18 million in equity. There is also a construction loan of about $12.6 million and a mortgage of about $3.6 million from Capital One. The goal is to have one building completed by January or February, if weather allows for that pace of construction, Blackstock said. The remaining six buildings should be completed by summer or fall of 2018. A quarter of the units will fix the rent at 30 percent of a tenant’s income. For the remaining units, a one bedroom will cost $714-$870; $845-$1,120 for a two-bedroom and $981-$1,197 for a three-bedroom unit. The event featured several speakers including Clayton Mayor Tom Bianco, state Sens. Stephen Sweeney and Fred Madden, Freeholders Heather Simmons and Joe Chila, and the veterans liaison from U.S. Rep. Frank LoBiondo’s district office. Blackstock, accompanied at the event by her husband Paul, the chairman of the foundation’s Board of Directors, told the story of her father-in-law, J.P. Blackstock, who stormed the beaches of Normandy on D-Day and was disfigured in a later battle. After years of rehab and help from volunteers, he dedicated the rest of his life after his service to volunteering with veterans. “To be able to do all this in the memory of my father-in-law, to get affordbale housing built for veterans, it’s just a massive feeling,” Blackstock said.